I have a problem. When it comes to certain things I am a crazy perfectionist. I dismiss a lot of really awesome design ideas because I feel like they are not good enough. Of course my "curse" has not led me to become a crazy famous knitting designer. It actually hurts me. This is why I've been swatching for over a week. I swatch. I rip out. I swatch. I curse. I rip out. I *think* I've finally figured things out for this song. The math and the crux of the design has been done forever. But the motif for this first section has been giving me gas! But I think I finally got it right. This yarn is wonderful though. Such a beautiful shade of silver grey. 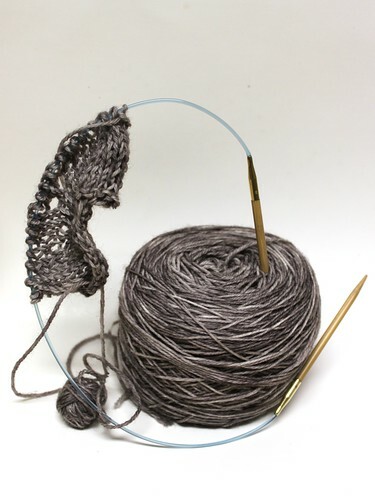 And you need some Paca Peds with the heel-toe skein so you can make this design when it comes out!